Convenient and hassle-free BritRail Pass delivery, right to your doorstep, free of charge! Read on our travel guide for London – know the best spots and activities in town to maximize your experiences! Wonderful experience with Klook’s BritRail passes. Delivery came within a week. We had a great time traveling the outskirts of London with ease. Pass was recognised & can be used on Heathrow Express too so you may want to save money on that. Some stations don’t require you to write day so we actually used the pass for 4 days instead of the states 3 days. Pass can also be used to travel to Warner’s Brother Harry Potter Studio via train. Very value for money, especially when England is expensive on their transportation. Highly recommended! 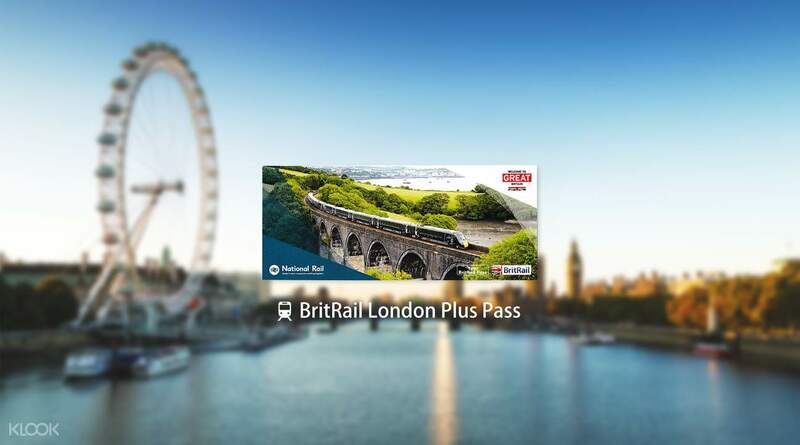 Explore London without the hassles of figuring out your day-to-day transportation by purchasing the BritRail London Plus Pass. Giving you unlimited access to the train systems in London and nearby areas such as Oxford, Cambridge, and more, this pass is simply a must-have for visitors who wish to make the most out of their time in England's capital city. Enjoy the convenience of having your pass delivered directly to your doorstep, free of charge! Once you're in London, just present the pass at participating train stations, and you're good to go. Choose among 3, 4, or 8-day passes, depending on your travel needs, and experience the freedom of hopping on and off London's trains at your own pace. You'll also enjoy additional perks such as the 2FOR1 entry promotion, which lets you visit two of the city's most popular attractions for the price of one! Wonderful experience with Klook’s BritRail passes. Delivery came within a week. We had a great time traveling the outskirts of London with ease. Pass was recognised & can be used on Heathrow Express too so you may want to save money on that. Some stations don’t require you to write day so we actually used the pass for 4 days instead of the states 3 days. Pass can also be used to travel to Warner’s Brother Harry Potter Studio via train. Very value for money, especially when England is expensive on their transportation. Highly recommended! Wonderful experience with Klook’s BritRail passes. Delivery came within a week. We had a great time traveling the outskirts of London with ease. Pass was recognised & can be used on Heathrow Express too so you may want to save money on that. Some stations don’t require you to write day so we actually used the pass for 4 days instead of the states 3 days. Pass can also be used to travel to Warner’s Brother Harry Potter Studio via train. Very value for money, especially when England is expensive on their transportation. Highly recommended! It is easy to use and travel at London by train. You need not book the train ticket beforehand. Travel with the pass to Brighton and Oxford to save time and money. It is easy to use and travel at London by train. You need not book the train ticket beforehand. Travel with the pass to Brighton and Oxford to save time and money. A really convenient physical pass! No prior booking is required for the train & you can freely board any even during peak timing and with free seating. A really convenient physical pass! No prior booking is required for the train & you can freely board any even during peak timing and with free seating.